I have said it before, but it is worth repeating: I blog because of the wonderful community of quilters online helps me make connections and grow as an individual and as a quilter. Today is a case in point: if I were to only be a modern quilt guild member, I probably would never have had the wonderful opportunity to get to know Lara @Buzzin Bumble or be introduced to her awesome raw edge applique method that she presents in her new book, Crafted Appliqué. When Lara reached out to me to see if I would be interested in trying her technique and blogging about it, I had absolutely no hesitation. Appliqué has never been one of my strong skills as a quilter, and I was eager to learn more and improve my skills. Let me tell you, Lara’s method does not disappoint and I am excited by the possibilities that her method opens up for me creatively. When I received the book from Lara, I eagerly sat down and read about her method. She does a fantastic job explaining her technique, but what I truly appreciate (and what appealed to my nerdy technical side) was her side by side comparison of her method to other raw edge appliqué methods; methods I had used in the past. As I was going through the comparisons, I could see the areas I struggled with using applique methods in the past and it made me giddy excited to have a try with her method. No fray? I couldn’t wait to try! Crafted Appliqué contains 7 different projects within the book, but I was itching to use the rest of my Celestial Lights palette (the other half was used for The Humans Are Dead). Once I had the fabric for my project selected, then I had to figure out what I was going to do with them. I brainstormed for a bit, and hit upon the idea of layering orange peel shapes to create an ombre design. I found the perfect set of Orange Peel Block templates on Craftsy from Caroline @Sew Can She, and I was off and running. Almost as soon as I made up my mind what I would be making, I knew that this mini quilt belonged with my friend Jess @Quilty Habit. And as luck would have it, last Sunday I had the pleasure of going to lunch with a group of friends, and I thought that the wall behind our table was a perfect location to hang and photograph this mini quilt. Let’s talk details, yes? I used all three sizes of the orange peel template and layered the shapes onto my chosen background. And then I started quilting. Yup, I did not top stitch down the shapes prior to quilting… and they stayed put. Even better, in the very center of the quilt there is a lot of fabric bulk, and the shapes did not shift or gather. To be fair, the first thing I did was to secure each applique shape via quilting, starting with the white, small orange peel shapes and working my way out from the center of the quilt. Then I went back and added the echo quilting within each orange peel. Look at those raw edge appliqué edges! I spent about 8 hours quilting this mini quilt on my domestic machine, turning it this way and that; scrunching it up to fit, and the edges still look like I have just cut them. Channeling my inner Renee @Quilts of a Feather (I was inspired by her Bat Falcon quilt), I marked a 1/2-inch grid on the background and finished the quilting with more orange peels. As you might be able to see in this photo, while I did my best to avoid the edges of the appliqué as I worked on the orange peels, I would occasionally dip into the raw edge. But the method held up: there is no fraying. For the quilting, I used 50wt Aurifil 4030 (Plum) and I really love how its slightly more magenta than true purple tone works with the fabric in this mini quilt. 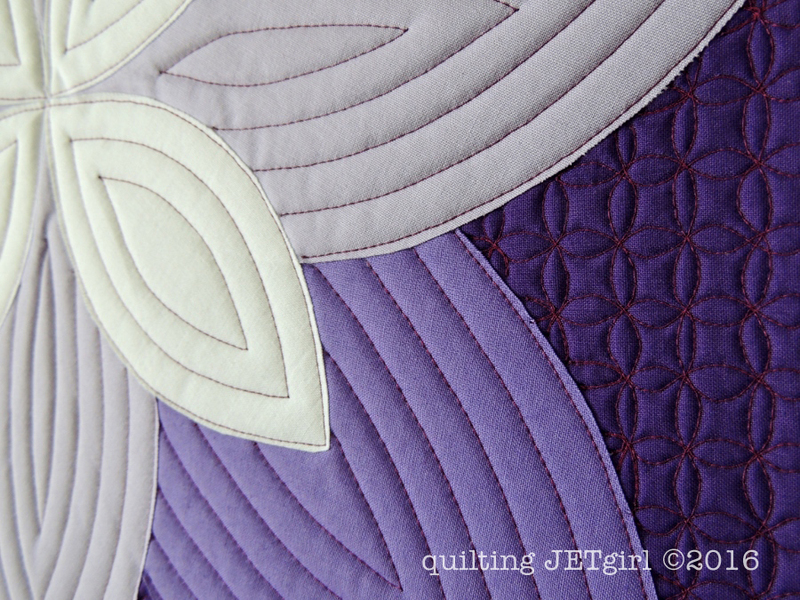 And using a solid for the quilt backing really is a fun way to see how the quilting shines. I am really thrilled with Lara’s raw edge appliqué method, and I know I will be using it again in the future! Lara is offering a copy of her book to one lucky reader! Use the Rafflecopter entry below to enter to win. The giveaway closes on Thursday, May 26th. If you just can’t wait and want to buy a copy of the book right now, have no fear – Lara has offered to refund your money if you win a copy in one of the giveaways! You can purchase a signed copy on BuzzinBumble, or buy it from the AQS shop or through Amazon (all non-affiliate links). *Note that Amazon was sold out of the book but should be back in stock today! If you want more opportunities to win a copy of Lara’s book, or if you want to get other points of view on Crafted Appliqué, the full blog hop schedule is below. Disclosure: This book was provided for review by the author. All opinions expressed are my own and have not been influenced by the businesses involved. How to start with free motion quilting on a normal machine. I really love your beautiful quilt! I definitely want to learn Lara’s applique method, and also free motion feather quilting. I’d love to be able to machine-appliqué successfully. Thank you for the opportunity to win a most intriguing book. I’m good with slow and steady by hand but intimated by the speed in the machine even when I have it on slow. I’d like to be more confident on the machine. I’m interested in anything and everything about quilting, especially modern design. I love to applique and this new method has me very interested. Thanks for the great giveaway. Love, love, love this one, Yvonne! Such a great, simple and graphic design. Your quilting is the perfect touch! I can’t wait to order a copy of this book. 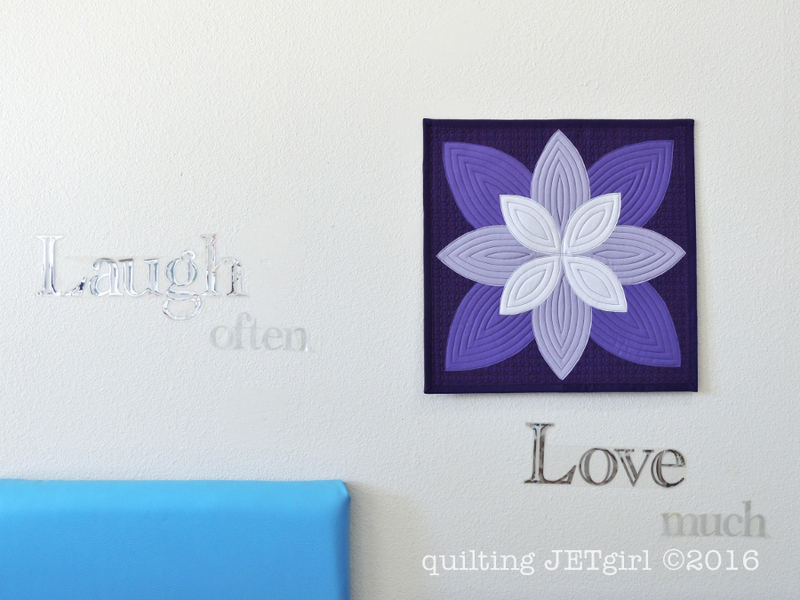 Love your quilting too. Your orange peel example of crafted applique is really gorgeous! 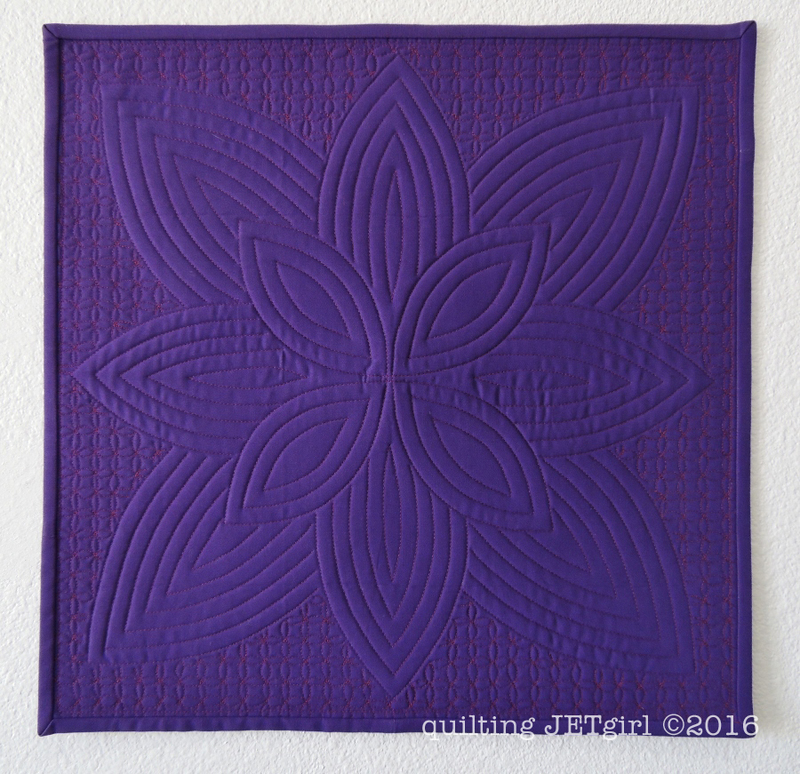 Your free motion quilting is awesome. Just beautiful. I find Lara’s applique method most intriguing. I would love to learn more about it and free motion quilting. Free motion quilting of feathers. I would love to learn more about paper piecing. Beautiful work! The quilting really sets off the design, Lara’s process works so well for applique. Hi Yvonne, What a great blog! I’ve just spent the morning with your Gallery. What great fun to see your skills and creativity grow over six years. As a beginner quilter you inspire me to keep with it. 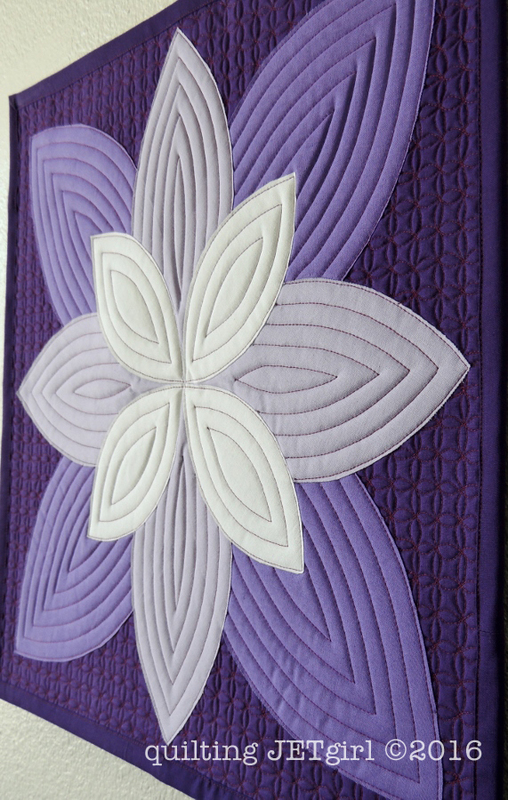 Love the purple, love the graphic impact of those orange petal shapes getting bigger and bigger, love the quilting! I’d like to learn more about free motion quilting (and how to do BIG quilts!). I would love to win. I would like to learn more about this type of apique. Very nice arrangement of the three sizes of orange peel. 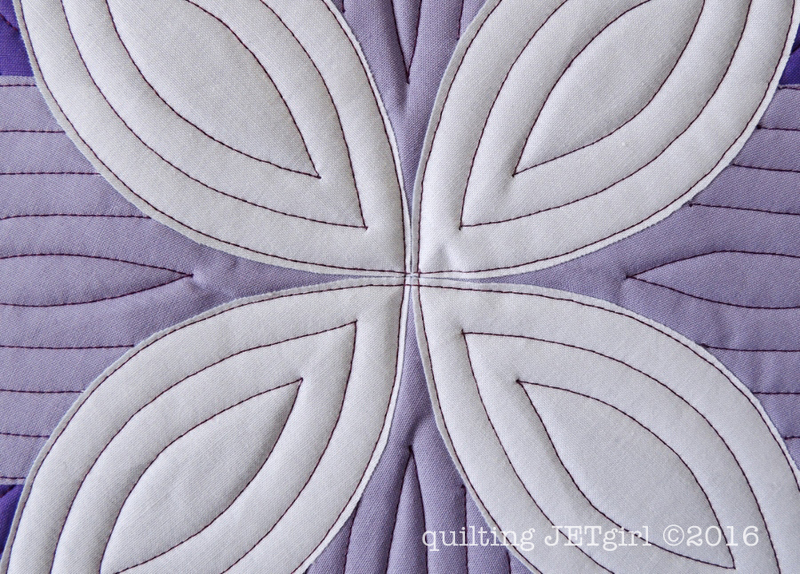 And the simple quilting highlights it very nicely. 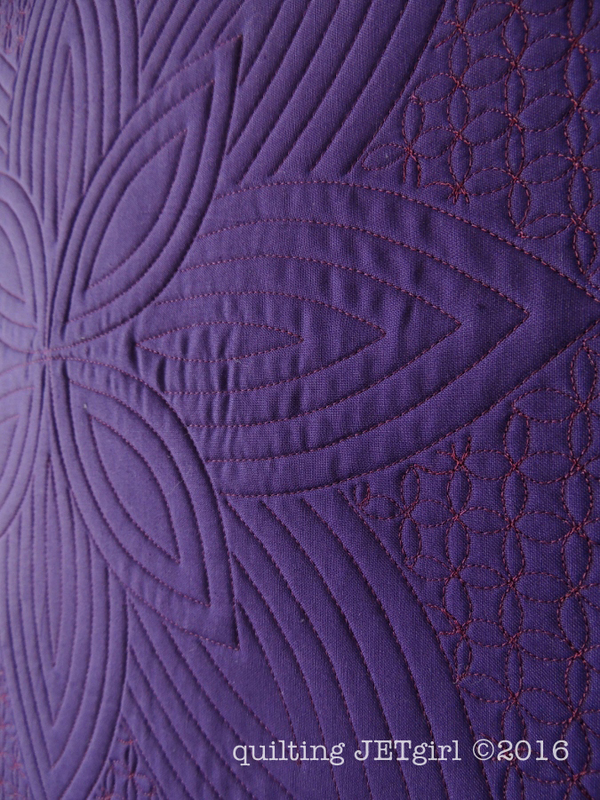 The quilting is so wonderful on your mini! I just have to try this new technique. I’m so intrigued by this method now, so you’ve got me wanting to learn more about Lara’s method! But really, I have a really strong desire to learn just about anything related to quilting. There’s always more to learn!! I would love to learn to applique and free motion quilting. Oddly, I want to learn more about this applique technique. I avoid applique, but I LOVE your project so much that I am tempted to try it. I really want to learn to FMQ on my sewing machine. I need to learn soon. Your mini is amazing and so perfect for Jess! I am intrigued by Lara’s method. The results have looked so impressive. Your fmq looks fantastic on this one, especially on the solids. Wow, your edges look amazing and what incredible quilting too.